Ten years is a long time. Sometimes it is so long that one forgets a lot more than one remembers — like the fact that it I have been blogging for a decade. I would have totally forgotten about the amount of time that has passed, had it not been for (what else) a blog post from Fred Wilson, one of the more engaging and rigorous bloggers on the web. It just so happens he is a venture capitalist, but he would be a great blogger without the VC tag as well. His post made me ask myself: how long has it been since I have been blogging? Not an easy answer. I have had a website for a long time — mostly as a repository for articles I wrote for Forbes.com, Red Herring and a bunch of other publications. It had my resume as well. In the heyday of the dot.com bubble, I started writing an email newsletter (dubbed dotcomwala) and saved the archives on my website. There wasn’t much to do on the site. I ended up using Blogger, but mostly as a way to manage the site more easily — well, easier compared to Homesite & Dreamweaver, two tools I used for managing my website. Along the way I became a reader first of Dave Winer and then Doc Searls. Their engaging and pithy, rapidly-updated style of linking and writing was so seductive that I started mucking about with Dave’s blogging platform(s.) I was trying out Dave’s Userland software long before it all made any sense to me. In September 2001, Dave blogged about the tragedy that changed our world. It was pretty clear that Winer had laid out what was going to be the future of media — and it still is. Today we differentiate between blogging on blogging platforms and sharing on social platforms, but that is just semantics. The essence of blogging is not defined by a platform but by what I learned from Dave and his blogging platform — that media now is raw, collaborative and instantaneous. Initial posts were still some of my articles from the Red Herring, but eventually I summoned up the strength to emulate my blogging heroes. I wrote and wrote and I guess I am still writing. In the process I became less interested in the rote work of a magazine — I was addicted to the blog and the daily interactions. I wrote every day and every day traffic went up. More importantly, more people joined the community of readers. My blog became a collaborative whiteboard /sounding board for my book, Broadbandits, which I had just begun writing. Being addictive in nature, I was quickly hooked. The idea that all these smart people were sharing all their insights with me was the greatest feedback loop of all time. With every blog post, I engaged and learned. Ten years later, that learning continues. Not a day goes by that doesn’t see one of our readers leave a comment that makes me re-evaluate how I look at the technology or a topic I just wrote about. I shared my opinions, I linked to stories I liked and more importantly, I used the blog to write/break news. My editors — Jason Pontin, Blaise Zerega and Josh Quittner — didn’t mind because I worked for monthly magazines and all of them knew that I was a “news” guy pretending to be working for a magazine. When I was working for Forbes.com during the early days of the dot-com bubble, I learned a vital lesson – you had to write every day to be any good and to have a complete handle on the beat. There was no way around the plain-old beat the pavement reporting. Somewhere along the way the allure of blogging became such that I had to go tell my boss, Josh, that it was time for me to go and embrace my destiny. I loved Business 2.0 more than I loved anything, but I overstayed by almost 18 months before I could pull the trigger. Ironically it was a late night drunken conversation with Matt Mullenweg, Mathew Ingram & Paul Kedrosky in Toronto (where I was a speaker at the debut Mesh conference) that did the trick. In 2004, Anil Dash, also an early blogger (and inspiration) had introduced me to Toni Schneider (now CEO of Automattic) who had then sold a company to Yahoo. I wanted to talk to him because I had seen that we were going to enter a “lean startup” phase where the model was to build a product and exit by selling out to larger companies who needed some quick tuck-in products to complete their line-up. That one conversation led me to the other Tony (Conrad) and the story, The New Road to Riches. Photo courtesy of Laughing Squid/Scott Beale. So when it came time to leave, I went and chatted with Toni and Tony who led me to the newly formed True Ventures. A small seed round later, we were off to the races, trying to turn what essentially began life as brochure for my writings into a startup and eventually into a business. As Josh would quip, I ate my own dog food. Life changed, forever, with that one act. And I am better for it. I have gone from being a lone writer to being part of a team. I am still learning the social skills that go along with being a founder. But that is a story for another day. About 3 posts a day, every day for roughly 10 years. About 215 words per post. In 2002, my first real and full year of blogging I wrote 187 posts and 35,105 words. By 2005, the total number of posts was up to 2,685 posts and 429,595 words. 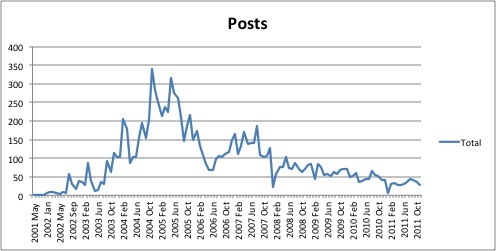 In 2010, the total number of posts had gone doWn to 283 and the total number of words slumped to 109,794. Average words went from 199 per post to 160 to 388 words/post. 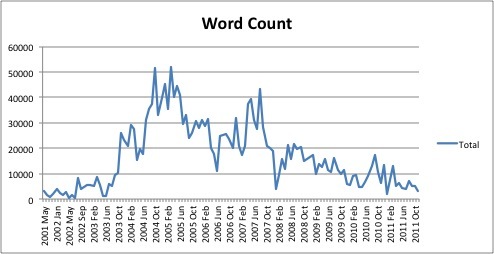 2011 has been much slower – 136 posts at 465 words per post and a total of 63,223 words, year to date.) I think majority of my writing for 2011 has been focused on big picture stuff including my occasional newsletter, Om Says. My top three most productive months are November, December and August — I guess I like writing during the holidays as it gives me more time to think and write. November 2004 was the most productive month of my blogging life – 339 posts followed by December 2004 when I wrote 283 blog posts. The second half of my blogging decade was marked by the rise of Twitter and other social medium. However, Twitter was (and still remains) the most active social sharing platform for me. I wondered if I my Twitter habit was costing me some blog posts. So I looked at my Twitter stats. 22,596 tweets over 1958 days or roughly 11.4 tweets a day. Assuming each tweet was about 10 words a tweet, that was still about 110+ words every day in tweets, though in reality actual words being spent on “tweets” were far fewer since many of my tweets are simple transmissions about my photos or blog posts. According to Tweetstats, I average roughly 510 tweets per month, with a preference for tweeting at 7 am (PST), especially on Wednesday, my heaviest tweet day. So from the looks of it, Twitter has only acted as an accelerator for my blogging role, allowing me the luxury of writing less but reaching far more people. If the first five years were of extreme frenzy, then the second half is reflective of changes that happened not only in my work life but also in my personal life. As the data shows, my starting the company and taking on the founder duties acted as a speed bump and slowed down my blogging pace. Starting in 2008, I started to cut back on my daily work load and focus on my health. So far so good. Since 2010, thanks to GigaOM team, things have become more manageable for me. It is a good question. I have actually been thinking a lot about that lately and wondering how to reinvent the art form that I embraced over a decade ago. I don’t really have an answer, except that it is somewhere in the past and in the reasons why I fell in love with blogging. It is pretty evident to me that chasing faux-stories that are cloaked as scoops or exclusives are of little or no interest to me. Sure, there will be a story or two like Microsoft buying Skype that will help make the old reporter in me ready to work around the clock, but in reality what does interest me is the “big picture” stuff. And if I can do it with more rigor and regularity, I would be happier (and better) for it. One of the most pleasant (and surprising) developments of 2011 was me starting to write, Om Says: What To Read This Weekend. I started it mostly because I felt that we are continuously being bombarded with short, near term news and in the process failing to think about the big picture. I thought to myself hat our business has to be about more than just a feature upgrade or funding, or some new app. At the same time, thanks to two awesome apps — Instapaper and Evernote — I was saving articles I would find and read during the week, often as triggers for further ruminations. I decided to share the best of seven from what I had read during the week, and the response has been pretty phenomenal. Why? Mostly because curation and sharing of content has become as important as writing. By sharing videos, photos, links, or quotes we are all essentially editors and the sharing itself is an act of editorializing. It was as Dave (Winer) showed during the dark days of September 2001. Ironically, it was a lesson that I forgot. In late 2006 I started writing a link blog, The Daily Om, but stopped doing it mostly because a yoga-oriented journal objected to it and I didn’t feel like working on it. Lately, I have started culling interesting videos, quotes and news snippets on my personal blog. I have found it invigorating and will continue to experiment with new ideas. Blogging is communal: In 2008, I wrote that “blogging is not just an act of publishing but also a communal activity. It is more than leaving comments; it is about creating connections.” That is the single biggest lesson learned of these past 10 years. Every connection has lead to a new idea, new thought and a new opportunity. Being authentic in your thoughts and voice is the only way to survive the test of time. Being wrong is as important as being right. What’s more important — when wrong, admit that you are wrong and listen to those who are/were right. Be regular. And show up to blog every day. After all you are as fresh as your last blog post. Treat others as you expect yourself to be treated. (In 2006 I wrote this and it is worth repeating) Doc Searls once told me, and it has been one of the guiding principles for me: blog if you have something to say and respect your reader’s time. If you respect their time, they are going to give you some time of their day. A long time ago, Slate’s Farhaad Manjoo asked mefor some tips on blogging and here is what I told him — Wait at least 15 minutes before publishing something you’ve written—this will give you enough distance to edit yourself dispassionately. Write everything as if your mom is reading your work, a good way to maintain civility and keep your work comprehensible. Blogging is not about opinion but it is about viewing the world in a certain way and sharing it with others how you look at things. Many bloggers tailor headlines and posts so that they’ll surface at the top of search results, making them at once easier to find and less enjoyable to read. And this decade, a lot of other bloggers mistook a strong writing voice for caustic irreverence. But most eventually learned that writing with snark is like cooking with salt — a little goes a long way. If anything, avoiding that trap Kevin mentioned is the biggest lesson of them all. Disclosure: Automattic is backed by True Ventures, a venture capital firm that is an investor in the parent company of this blog, Giga Omni Media. 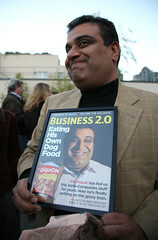 Om Malik, the founder of Giga Omni Media, is also a venture partner at True Ventures.